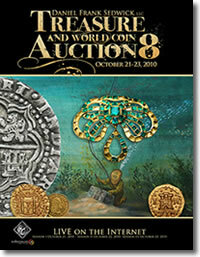 Daniel Frank Sedwick, LLC announces the release of their Treasure and World Coin Auction #8, held from October 21 to October 23, 2010, comprising 2789 lots, by far their largest sale to date. "This is not just a treasure auction — it is also a world coin auction, our first big offering of gold and silver coins from countries all over the world. Like never before, there is certainly something for everyone here." As usual the auction will start with Gold Cobs, more than 50 of them this time (mostly from shipwrecks), including several of the finest known 1715-Fleet specimens: a full-date and exceptionally struck Mexican 8 escudos 1714 and 4 escudos 1715; a near-perfect Lima 2 escudos and probably the finest known Lima cob 1 escudo, both dated 1710 and encapsulated PCGS, the latter MS-64. Also there are no less than nine Fleet "bogeys" (Bogotá 2 escudos) in this sale. The next section, World Gold Coins, contains over 300 lots, most of them Spanish Colonial "busts," including: the finest known Mexican 1 escudo 1733/2, recovered by Marty Meylach from the 1733 Fleet and the inspiration for his book Diving to a Flash of Gold; a unique Santiago, Chile, 1 escudo, 1755/4, from the famous Eliasberg collection; and well over 100 Spanish colonial bust 8 escudos by date, most of them starting below melt value. The Ingots section features a collection of large, natural gold nuggets, as well as several important 16th-century ingots (including "tumbaga") and a unique silver "piña" ingot from the Atocha (1622). In Shipwreck Silver Coins bidders will find hundreds of Atocha (1622) silver coins, both rarities and wholesale lots, in addition to coins from dozens of shipwrecks around the world assembled by two different collectors. The Silver Cobs sections for Mexico, Lima and Potosí contain no less than four Royals (round presentation specimens) in various denominations. The Lima listings are dominated by the collection of Robert Mastalir, including a nearly complete date-run of 1R that contains several unlisted overdates. Featured in Other Cobs is a Santo Domingo 4 reales of Charles-Joanna (one of very few ever offered at auction), as well as a large collection of dated cobs from mainland Spanish mints. Following a short but varied Ancient Coins offering (the first for Sedwick), the expanded World Silver Coins section comprises over 600 lots, with particular emphasis on Colombia (featuring Part II of the Herman Blanton collection) and the British Isles (Great Britain, Ireland and Scotland). There is also a large collection of British Admiral Vernon medals. "Our most important items are in shipwreck artifacts, however," says Sedwick’s assistant Agustin "Augi" Garcia, whose new book The "Tumbaga" Saga about some conquest-period silver bars is being released at the same time. "Of particular significance is a unique Tarascan (Mexican) silver rodela (plate) from the "Tumbaga wreck" (ca. 1528), featured in my new book and the important link for figuring out what the silver ingots of that time were made of." The Shipwreck Artifacts section also features a large gold-and-emerald pendant and a gold religious medallion and chain from the 1715 Fleet, followed by many lots of small artifacts from the 1733 Fleet, the collection of Marty Meylach himself. Non-shipwreck Artifacts include a large selection of colonial-era weapons, mainly flintlocks and swords, as well as several natural history items like fossils and scrimshaw. The auction is rounded out by Documents and Media (books and catalogs), ending with a special, full-color, hardbound, limited edition #1 of 50 copy of Augi’s much-anticipated book The "Tumbaga" Saga, which the author will personally inscribe to the winning bidder. Prospective bidders must first register, which can be done directly on iCollector by going to www.icollector.com/sedwick. Daniel Frank Sedwick, LLC also has the honor of being the only auction company in the world specializing in Authentic Treasure. Auction catalogs are accessible on the web and printed in a high-quality format with full-color illustrations for all lots. The fourth (2007) and third (1995) editions of this well-known book were authored and co-authored by Daniel Sedwick, who is also a contributing editor to The Numismatist.